In last months blog post we looked at two of our favourite journeys in the North East. This month we’d like to share two more of our favourites with you! This time we’re looking at the beautiful Northumbrian Coastal route to Holy Island and the historic drive alongside Hadrian’s Wall. If you have any suggestions for great roads or journeys in the North East please get in touch. Our longest recommended drive is also our favourite. The route along the Norhumberland Coast offers spectacular views of our beautiful beaches and historic castles. We suggest leaving the A1 North at Alnwick and driving through the beautiful seaside villages like Seahouses and Beadnell. 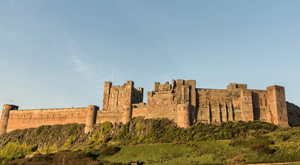 After a brief stop at Bamburgh Castle re-join the A1 until you see signs for Holy Island, but remember to check the safe times for the causeway! This journey takes you parallel to Hadrian’s Wall, often coming within metres of the ancient ruins. It’s often thought that the original road was built by the Romans given how straight it is, however It was in fact built in the 1700’s when the Jacobite risings meant armies had to travel from Newcastle to Carlisle a lot faster. 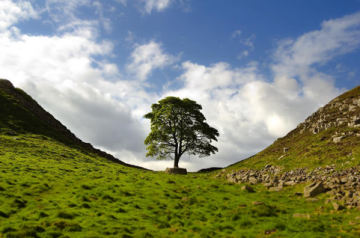 We suggest driving to Steel Rigg car park, from here you can talk a breath-taking walk alongside the wall, eventually arriving at Sycamore gap.